Extra heavy-duty telescoping shipping tubes that adjust to meet many size requirements. Yazoo’s adjustable shipping tubes are the answer for shipping industrial parts, metal rods, tooling, or heavy objects. They have the flexibility to cover lengths from 30” to 60” or 60” to 120”. These telescoping mailing tubes offer a great alternative to purchasing custom-made sizes, are sold in small quantities, and help reduce storage needs. The tubes come with metal end plugs that are already pre-attached, with the tubes loaded and sealed from the center. 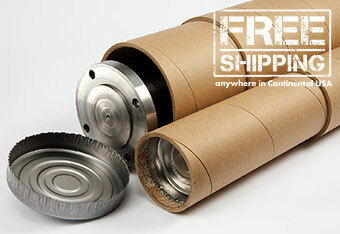 Need adjustable shipping tubes fast? We’ve got you covered. Our tubes are available for FREE same-day shipping on orders placed by 4pm EST. Prices include tubes and metal end plugs, as well as shipping charges to anywhere in the continental USA. 15% off 8 cartons or more of any Yazoo stock mailing and shipping tubes.